Tashlich comes from the Hebrew word meaning "to cast," referring to the intent to cast away our sins via this meaningful and ancient Jewish custom common to both Ashkenazi and Sephardic communities. Tashlich is usually performed on the first day of Rosh Hashanah. If the first day of Rosh Hashanah falls on Shabbat, Tashlich is done on the second day of Rosh Hashanah. It may be performed up until Hoshanah Rabba (the last day of Sukkot), as some communities are anyway accustomed, except on Shabbat. We commemorate the self-sacrifice of Abraham by going to a river bankSpecial verses are recited next to a body of water, such as a sea, river, stream, lake or pond, preferably one that has fish (though when no such body of water was available, some rabbis were known to do Tashlich next to a well, even one that dried up, or next to a bucket of water). Upon concluding the verses, the corners of one's clothes are shaken out; for males, this is usually done with the corners of the tallit katan (tzitzit garment). Though Tashlich is not mentioned in the Talmud, its earliest reference appears to be in the book of the Prophet Nehemiah (8:1) which states, "All the Jews gathered as one in the street that is in front of the gate of water." This gathering is known to have taken place on Rosh Hashanah. One reason for saying Tashlich next to water goes back to Abraham's trip to sacrifice his son, Isaac, which took place on Rosh Hashanah. On the way to the designated location, the Satan tried several times to undermine Abraham's progress. One of the Satan's tricks was to have a river materialize and block Abraham's path. Undeterred, Abraham forged on straight into the river followed by his small entourage. Upon reaching the middle of the river when the water reached his neck, Abraham prayed to G‑d and the river dried up. We commemorate the self-sacrifice of Abraham by going to a river bank. Another reason for saying Tashlich next to a river is because Rosh Hashanah is the day when we coronate G‑d as King of the Universe. Jewish kings are anointed next to rivers, and so it is appropriate that we crown G‑d as our King next to a river, as well. Going to a river bank or sea shore is also awe inspiring as we contemplate G‑d's mercy in preventing the waters from flooding the dry land. The realization of G‑d's omnipotence inspires us to repent. Though we do Tashlich beside an earthly river or sea, this watery entity actually represents its Heavenly counterpart. Jewish mysticism teaches that water corresponds to the attribute of kindness. On Rosh Hashanah, we beseech G‑d to treat us with kindness during the new year. Water with fish is optimal since fish are not subject to the "evil eye" and are also known to have many offspring. Fish do not have eyelids, so their eyes are always open. This is likened to G‑d's constant supervision over us, and we pray that He mercifully care for us. Also, just as fish may be caught in a fisherman's net, so, too, we are caught in the net of judgment. This awareness helps awaken us to repent. Just as fish may be caught in a fisherman's net, so, too, we are caught in the net of judgmentWhile there are different versions and verses of the Tashlich liturgy depending upon community, what are common to all are the verses from the book of Micah (7:18-19) "Who is a G‑d like You..." These words correspond to G‑d's thirteen attributes of mercy which we seek to arouse on Rosh Hashanah as we are being judged; the allusion to these thirteen attributes is known to always be beneficial. May we all shake ourselves from sin and be signed and sealed in the Book of Life for a good and sweet new year! Mrs. Nechama Dina (Dinka) Kumer, originally from Nashville, Tennessee, is the former executive secretary of Ascent of Safed. tashlich "hough when no such body of water was available, some rabbis were known to do Tashlich next to a well, even one that dried up, or next to a bucket of water"
Thank you for making this beautiful ritual clear and meaningful. Thank you for such an informative article! I learned so much. Your clear and lucid explanations were both intersting and practical. I look forward to performing this beautiful custom in a new way this year. Wonderful Explanation and Description of Tashlich Sincere Thanks... for your detailed explanation and description of Tashlich. 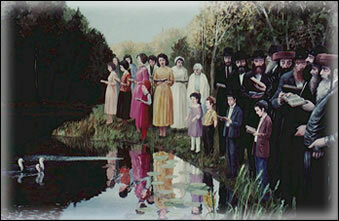 Your words not only explain the Tashlich tradition, but present a detailed picture of the ritual so that everyone can understand the whys and hows of it.